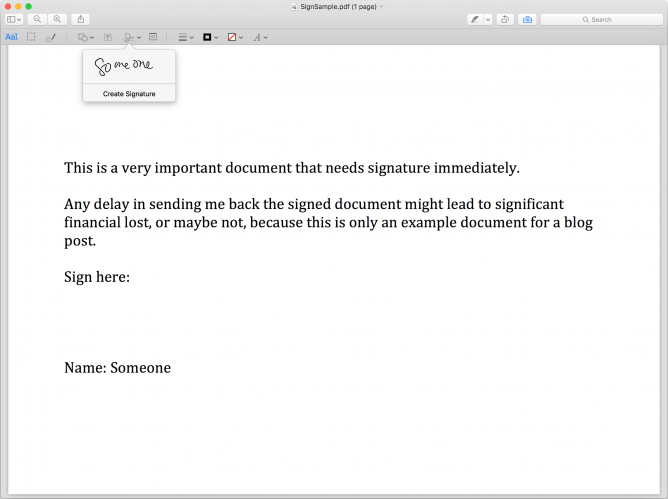 Do you know that we can add digital signature to PDF documents using Mac’s Preview app without the need to print the file? Sure we can do that using Adobe’s Acrobat Pro, but such software is not cheap, and not many people knows that Mac’s default Preview app provides very easy way to do so. First, we need to activate Highlights and Notes toolbar in Preview. We can do so from View menu, or using ⌥⌘4 keyboard shortcut. From there, you will see a button that looks like a signature, press that, and it will 2 options to input a signature: using trackpad or using Mac’s built-in camera. The camera way is my personal choice. I only need to sign an empty piece of paper, then show the paper in front of my iMac’s camera. Once I get the position right, it automatically recognises the signature and will save it in the system for future uses. We can even save multiple signatures in one Mac. Once a signature is added into a page, we can easily change its size to fit whatever area is in the PDF document. Simple, easy and intuitive. Finally, don’t forget to save the modified PDF document. This method can also be used to add text, freehand drawing or simple shapes. Note that protected PDF won’t be able to be edited using this method. You will need to obtain the unprotected copy of the PDF file. Hope this quick guide helps.